The first time I've ever heard of Tres Leches cake is through the Internet and I've been curious about trying it ever since. 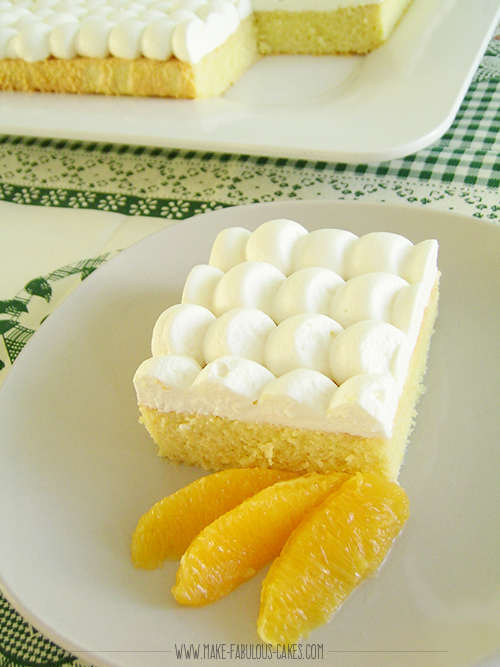 Tres Leches is a popular cake in Latin American countries like Mexico, Nicaragua and Cuba. I found a couple of Tres Leches cake recipe that were almost a like, I took bits and pieces from both recipes and incorporated it into one. The recipe entails making a light butter cake and soaking it with a what seems to be humongous amounts of glaze made out of three kinds of milk - evaporated milk, condensed milk and half and half or full cream . I took the half and half route since already I already find the cake to be too rich since it's going to be topped off with whipped cream. At first I was a little bit apprehensive when I saw the three milk mixture was about one liter. I was afraid that if I put all of it the the cake would turn mushy on me. But since most recipes called for the same amounts of milk, I decided to trust the recipe and cross my fingers and pray to the cake gods that the cake would turn out okay. After I've made and tried it, all I can say is where have I been all this time? This is the first time I have ever tried this cake... ever. So I have nothing to compare it from but I sure did like it. I decided to test it with the family. The cake tastes "like a flan" says my mom. Brother looks at the rather simple looking cake, takes a bite, was quiet for a moment and finally said,"mmm... It was bursting goodness in my mouth. I want this for my birthday". I think we have a keeper. 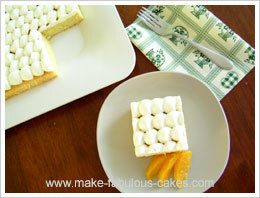 The tres leches cake is the perfect cake to bring for potluck diners. It's easy to whip up and I'm sure it will truly impress your friends. 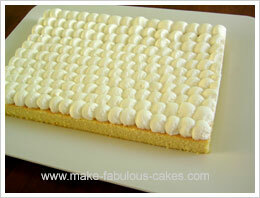 Most tres leches cake recipes indicates using 9" x 13" sheet pan. The resulting cake baked from this pan is really short, about 1" high. If you want a higher cake, use a smaller pan. Preheat the oven to 350°F. Prepare a 9"x13" sheet pan by lining with parchment paper. Whisk together flour, baking powder and salt in a bowl. Set aside. Cream butter with an electric mixer til light in color. Add sugar and beat for another minute. Add eggs one at a time, mixing after each addition. Mix in the vanilla extract. Add in the flour mixture and beat for a minute. Scrape down sides and beat for another minute. Pour the batter in the prepared pan. Smooth top with spatula. Bake for 20 to 30 minutes. 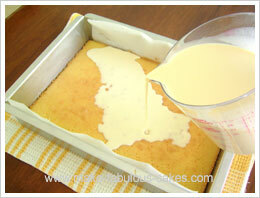 While the cake is baking, make the milk glaze by combining the condensed milk, evaporated milk and half and half cream. Set aside. 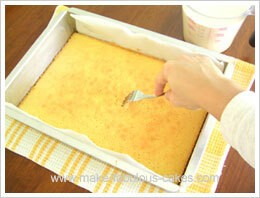 When cake is ready, take it out of the oven and poke some holes all over it with a fork. Pour in 3 milk mixture while it is still hot. Let cool. Chill for about 4 hours or overnight. When cake is chilled, prepare the topping by whipping cream with sugar and vanilla until medium to stiff peaks form. Spread whipped cream on top of cake with a metal spatula. Or if you want to be a bit fancier, use a pasty bag with a large round tip and pipe continuous beads on top like in the picture. Cut into serving pieces and enjoy!